2) 想換兩套, 試過check hkg->lhr 同 hkg ->fra 頭等, 試左好多日期, 如果出兩張都係要 waiting list, 一班機係唔係唔會放兩個頭等位俾人換? 3) 如果尾程係 nrt -> hkg , 呢程係唔係可以分開遲D 先換, 或者唔換, 自己買張單程機票? 4) 如果倒轉換先去hkg -> nrt, 再nrt -> 歐洲 頭等假單程, 咁換係咪都得? 小斯, 我想同一個朋友去塔斯曼尼亞, 點樣換機票最抵呀? 已儲AM16xxxx, 有冇機會坐商務呢? 小斯， sorry to bother you again, i just found 3 sets of tickets available on AM website..
which journey(s) should i redeem? and which one(s) should i buy ? i have 10,000 miles expiring by end of March, so it’s pretty urgent for me to decide where to go. my first choice’s actually japan (tokyo, osaka, hokkaido, or even nagoya) but all flights are full ! that’s why i am thinking about Europe. any tricks to book tickets to Japan? i have 70,000 miles available for redemption. you can rarely find flights for hot seasons, try november maybe. maybe you can travel southeast asia + japan? I would like to travel to Paris and Rome. Using the asia miles calculator (https://flyformiles.hk/new-am-calculator), I found that the following takes 65000 miles for Econ class. Is there any better way to redeem (using less AM)? Thank you so much for your help. sadly 65000miles is already the minimum required. It is not worth to redeem economy class for Europe. 佢而家換有分Standard & Choice, 所需積分有唔同, 以上例子係咪以Standard做例子? 我要去美東 (紐約, 波士頓, 華盛頓), 再去多倫多, 魁北克. 想坐頭等來回. 如果單程經濟先飛短途, 除咗日本, 仲有咩選擇? 因為唔想係日本openjaw東京/大阪, 距離遠唔夠時間完成北美行程(假期唔夠), 北美行程約15天. 如果就咁hkg-lhr 來回就 60000 里, 變相慳左 3000 里 ? total 係咪 (1)AV4500 + (2-3)AM 30000 + (4-5)AM 30000 +(6) AV4500 ? 係未咁樣可以出到? total 57,000 miles ? 但如果 香港 – 倫敦找不到直航, 要香港 – HEL/DUB – 倫敦, 那第一條單程還可以47000miles出到嗎? I have seen Luthansa as one of the AM partner. Is the following Itinerary OK? Or must I use JAL for the 2nd trip and add a open jaw return trip (e.g. KIX-HKG)? 預計4月初從KHH到BOS來回, 點可以換到全程商務 or 短程econ/p-econ + 較長那段商務? 係未咁樣可以出到? total 100,000 miles ? 小斯, 我SEARCH 機位( HK-> LONDON), ECON 位, CX, ,3 月後所有日期都係SHOW 底線, 其實係咪真係無晒位要WAITING LIST定係未放位? thanks! Please advise which one is better, (1) 2 one way tickets or (2) One world ticket ? 你好小斯~! 本人係儲里數新手, 想問其實如果上網兌換到既係咪得點到點來回? 如果有任何stopover / openjaw 係咪都一定要打電話去換架? 3. For itinerary 2 (CNX>HKG(stopover)>KIX?) – Mileage is 10000 for all econ? Econ +PEY is 14900? 4. How many miles will need for itinerary 1 in mix cabin of E+PEY, or E+Biz class? 1. Only possible if you are taking cx564 (hkg-tpe-kix) for one go. Changing flights is not permitted. 4. It is meaningless to get itinerary 1 as the connecting time is 1 hour only, you don’t have time to go out. Thanks! I have call on last Saturday night 930pm to Marcopolo line and got right through . I have issued CNX econ>HKG stopover>KIX premium econ(no more business) at 14800. Since my trip in in early January, tickets are very limited, business class is rarely seen. My return may need to take taipei stopover. 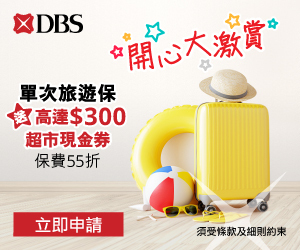 但無晒BUSINESS ….. 出票出ECON, 到WAIT倒有位 UP SELL 做BUSINESS,會不會好要用MILEAGE?? 2. 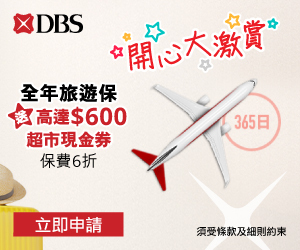 點樣可以查到日航機位？我上asia miles search唔到，想搵好有機位先打去hotline book. 如果我想去布拉格 / 奧地利 /, 可以咁換嗎?係唔係唔可以HK-布拉格, 奧地利 – TP – HK? 即係 HK – 布拉格 – (周邊城市) TP/JAPAN – HK? 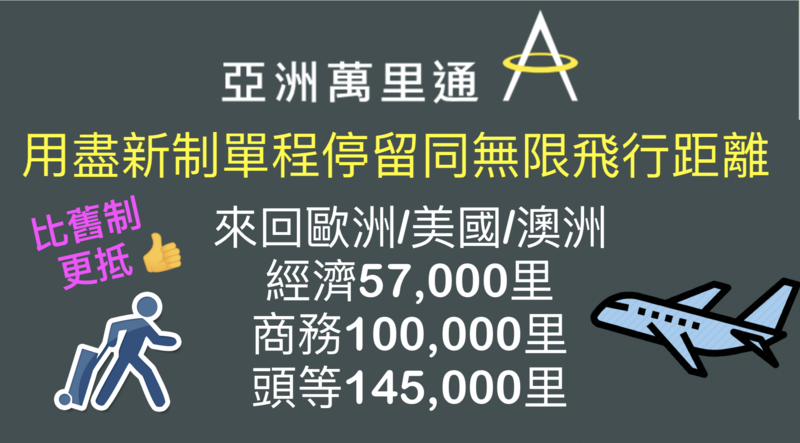 My plan is 香港-洛杉磯 (國泰航空) 洛杉磯-上海(美國航空) 商務90,000里. I went to Asia mile counter at airport and checked that CX has seat on Aug 2019 on some days. Then The staff checked that no available seat for AA for whole Aug 2019. It is almost 330 days before to make reservation. Please advise how can I check the available seat for AA or how can I know when AA will release the seats? 我唔係好明"由於iberia 唔可以換單程，所以呢一程短途一定要同長途個程做個openjaw 或 日本經台北返香港"呢一句呀, 即係我要點樣同customer service既人講呀? 即係第一程係香港-馬德里 (國泰航空) stopover 馬德里-上海/東京 (西班牙國家航空)? 我唔係好明”由於iberia 唔可以換單程，所以呢一程短途一定要同長途個程做個openjaw 或 日本經台北返香港”呢一句呀, 即係我要點樣同customer service既人講呀? —> I try to check online and business class ticket in Dec-18 costs 127,500. So 90,000 is only applicable in low season? I try to check online and business class ticket in Dec-18 costs 127,500. –> 90,000 for business standard only, low/high peaks are not specified for asiamiles. 大阪/名古屋/福岡-香港 (國泰航空) <–由於日航唔可以換單程，所以呢一程短途一定要同長途個程做個openjaw 或 日本經台北返香港"
HK-LHR + LHR-NRT = 單程A; KIX – HK = 單程B。新制不是逐個單程獨立睇的嗎? 單程B要同番LHR-NRT做 openjaw，咁咪同單程A果到溝埋左? 咁咪單程B 不是10,000 (ECON)? 2. 除左你所舉的地方(i.e.倫敦/巴黎/法蘭克福)，其他國泰去到的歐洲地方(eg. brussel, 羅馬、米蘭, etc.) 可唔可以咁玩法? Sorry for 1999 and Thank you! I would like to have one way ticket with stop over HKG-LAX-PVG. Since I want to hold the air ticket early for HKG-LAX on next year. If i make the booking first said HKG-LAX-PVG 11-Jul-2019 HKG-LAX (國泰航空) CX, then 16-Jul-2019 LAX-PVG 美國航空 AA. Later I change the booking HKG-LAX-PVG 11-Jul-2019 HKG-LAX from CX, then 28-Jul-2019 LAX-PVG. Do you know any charged for the the subsequent change. I check 美國航空 AA web site . it is free of charged. However, I check on Asis mile web site. Charge is required. 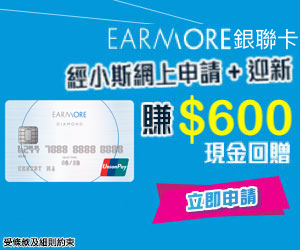 Hi 小斯, would like to redeem YVR-HKG- -KHH-HKG-YVR round trip (Business class), can I use the 100,000 Asia miles method? Best can stay in HKG twice, if using less mileage, can stopover in HKG and KHH once, thanks so so much!!! hello 小斯, 我幫屋企人問, 佢想用你O既方法, , 用最少里數, 食盡3個 trip, 唔知得唔得 ? 我真係唔多明佢咁 plan , 唔係3個來回咩 ? 麻煩請解答, thx ! 請問咁樣 plan 得唔得 ? 要幾多里 ? thx ! 另外, 今日我打左上AM 問, 佢話105,000先岩, 真係唔知佢點計, 佢話 by portion 咁計 ! 唔明??? 小斯, many thanks for your instructions. May I ask if the following route possible, please? you can’t redeem FRA-HND by ANA as ANA is not a member of One World alliance. 2. 另外請問如果坐長途機嘅時候(香港倫敦), 只係想瞓得舒服啲, 最好可以成個人瞓低, 其他嘢都無乜所謂, 揀商務定頭等好d? 想請教一下，is this possible with (i) as 1 one way and (ii) as another one way? (II) Tokyo/New York/HKG (Tokyo New York JAL, New York HK CX) ? 咁樣應該係計OPENJAW ? 因為日航冇單程票出. 我要OPENJAW 但冇直航的話我焗住要經台灣轉一次. I am sorry but one more quick question. Do you know if Tokyo / New York has first class? Cox I couldn’t find it from BA system. Many many thanks. Thanks 小斯。If I book economy, is it 47k(first 2 legs) + 10k (next 2 legs)? Can this be done on reverse order hkg/tpg/hnd/jfk/hkg? Many many thanks. 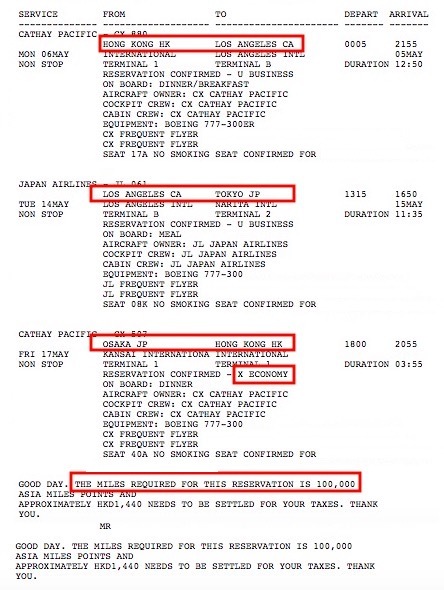 我找到了 芬蘭航空 AY1969, 這次飛行是否不能使用 asia mile? 1. 是否可以換到？若可以,是否可以第一程單獨單程，第二及第三程當另一個單程？min, 10k+47k = 57k Miles? 2. 若TYO -NYC is business class, NYC-HKg is premium economy, is miles required on a pro-rata basis, i.e. between 65k and 90k? 在果幾個月中間加一程由香港去東京, 東京-札幌-大阪, 請問可唔可以 再用番上一次換嘅 大阪-香港?? For JAL, does it work if the open-jaw is NRT (arrival) and HND (departure)? Wouldn't it be counted as a return rather than two one-ways? So the miles required would be 94,000 rather than 57,000 for econ? Do i need to phone Marco Polo or Asia miles to reserve the booking ? if opposite direction also OK? TOTAL IS 35000+47000 = 82 000? One way Econ 42000 point, Business 85000 points? “去到歐洲後，要再坐返一程返番去香港附近既國家，就一定唔可以坐國泰” , 呢點吾明, 點解返來香港吾可以搭國泰 ?